Lou Ann Bumstead, 78, of Wakefield died on Monday, September 23 at the Sawtelle Family Hospice House in Reading. Born in Westfield on June 20, 1935, she was the daughter of the late Ralph D. and Virginia (Houser) Neth. She was the wife of Robert M. Bumstead. Mrs. Bumstead is survived by her four daughters; Ellen F. Cummings, Emily A. Bumstead Gagnon, Susan R. Bumstead Chanley and husband Paul and Margaret L. Jordan and husband Kenneth all of Wakefield, She was the foster mother of Leslie S. Muzzio of MI She was the loving grandmother of David Virginia Thomas , Adam and Rachel. She is also survived by Michael J. Gagnon. 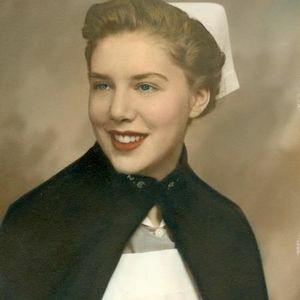 Mrs. Bumstead was a graduate of Westfield High School and New England Baptist Hospital School of Nursing. A life-long activist in the community, she was a member of the American Red Cross, Melrose Mothers Club, Melrose Women's Club, Melrose Chapter of the Eastern Star and served as Wakefield Registrar of Voters. Mrs. Bumstead was also the Past President of the Kappa Delta Psi Charitable Sorority. She was a Past Board Member of the Melrose Symphony Orchestra and the Prop Mistress and Melrose Community Players. Mrs. Bumstead was the Past Chairman of the Melrose Women's Republican Club, Melrose Republican City Committee and Wakefield Republican Town Committee. A funeral service will be held in the First Congregational Church, corner of Main and Common Sts., in Stoneham on Friday at 11:00. Visitation for relatives and friends will be held at the McDonald Funeral Home, 19Yale Ave., Wakefield on Thursday from 4-8 pm. Interment will be at Forest Glade Cemetery in Wakefield. The beautiful and interactive Eternal Tribute tells Lou's life story the way it deserves to be told in words, pictures and video. So many great ones. My sympathy to the family. Had a bad feeling when i could not reach by phone. Was very disappointed when Lou Ann could not come to last reunion..Lou Ann was a very kind, funny lady. Am kind of in shock myself. Marilyn Ross Class of 56. My Condolences to all family members. I was happy to have seen Lou Ann a couple of days before her passing to say good-bye. She still had her personality that day. She asked me" Are we still having fun?" I answered " we're both too old too have fun! Our legs are tired and can't take us out anymore! " She laughed. She asked for a kiss on the check and a hug. and it made her smile that day. I say goodbye to a great personality that I was lucky enough to have known . Good Bye to you Lou Ann. Make this sorrow slowly melt. And as you help them make it through. Draw them closer, Lord, to you. Sincere condolences on your loss. We are keeping you in our thoughts and prayers as you all go through this difficult time. Susan, So very sad to hear the news of your mother. You are in our thoughts and prayers. My sincere condolences to the Bumstead family. I will never forget the good times I had with her when she was running functions for Richard. She will be greatly missed.